Advanced Document Systems & Supply offers a large selection of Custom Round and D Ring Binding Covers. Our Clear Overlay Binders are ideal for reports and presentations that need to be easily customized with your own printed inserts. All of our overlay binding cover systems are made of the highest quality construction using heat-sealing and heavy-duty clear vinyl. They have concealed rivets, pockets on the front and back covers, and white/clear overlay on back, front, and spine. These binding covers allow you to customize your presentation in one simple step. Simply insert your document or sheet into the openings at the top of the front, back, or spine. 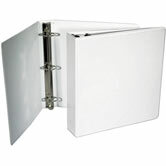 You can reuse the binder for any subsequent projects by simply switching out the covers and the inserted materials. We stock clear binding covers in both round ring and "D" ring styles. They are ideal for manuals, proposals, catalogs, reports, parts lists, presentations, directories, handbooks, price lists, and many other uses. Choose from a selection of 1/2" to 4" Binder Rings in white or black. We also offer Custom Ring Binders if you want a particular look and feel to your Binder. We can add your logo or presentation title on the front and spine and print the binder in any color. We offer silk screen or foil stamping for your custom presentation. Your ring bnders can be printed in any color or stamped with a large number of metallic and nonmetallic colors. Call us with a Pantone number or send us a sample to match. Custom vinyl and poly products are available. Please browse our catalog of additional binding supplies for all your binding projects, including coil binding supplies, wire binding supplies, thermal bind covers, document covers, and much more! We carry a wide selection of paper handling supplies, paper cutting supplies, binding machines, and laminating machines. Call our friendly and knowledgeable staff today at 800.808.2377.